You may or may not remember last summer's Clivia blooms. 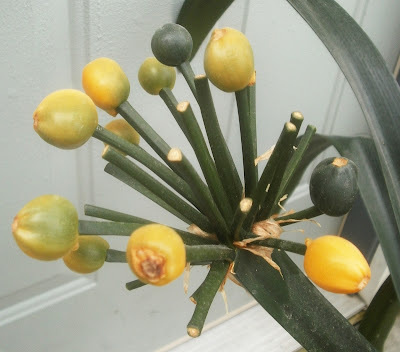 I apparently never bothered to say, officially, that the blooms had turned into fruits (or at least some of them did; I wound up with about a dozen), but that happened too. Except that it didn't turn red. So I left it on the plant. And then more of them started to change color, but they didn't turn red either. And so I worried. Maybe they're never going to turn red. Maybe something is wrong. It's probably just as well; I don't know what to do with them once they're ripe anyway. Easy come, easy go. Etc. It's just that nobody had ever told me. So now I guess I have some Clivia seeds to start. 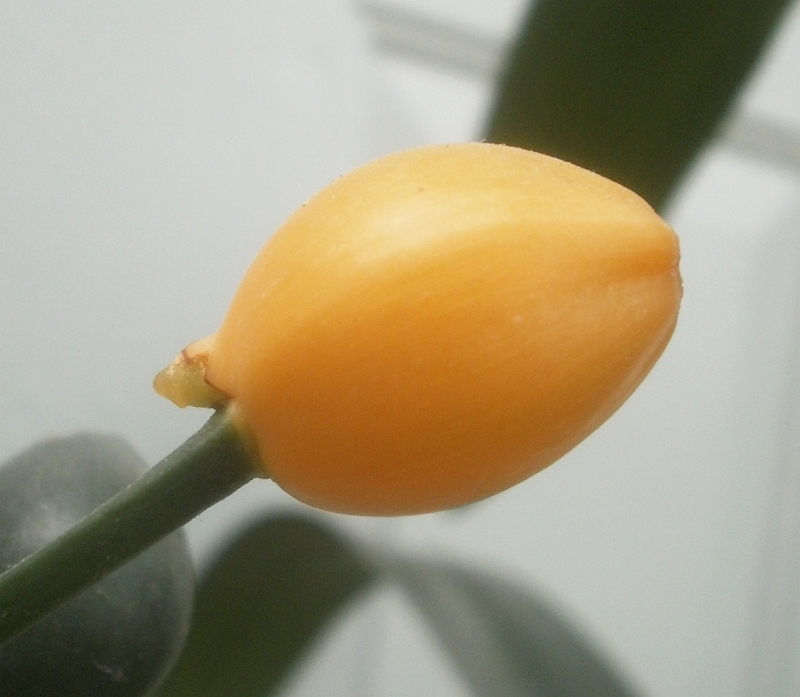 I'm not going to get too excited about this just yet, since a lot of what I'm seeing on-line about starting Clivia seeds makes them sound very susceptible to fungal diseases, and goodness knows we have some fungal diseases here. But, apparently we're further along in the process than I realized, so I'd best hurry and catch up. Not much to say. 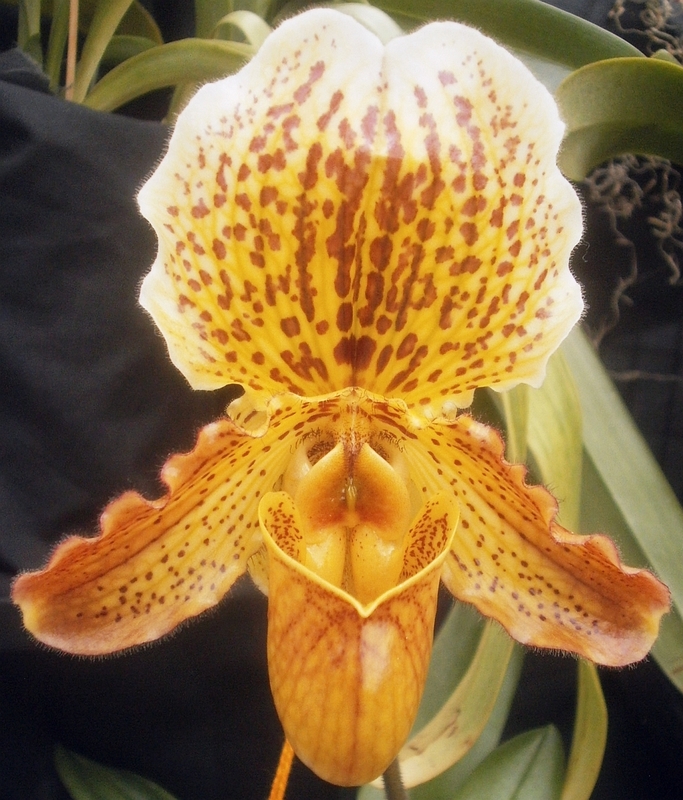 Paphiopedilum Golden Crest is Paphiopedilum fairrieanum x Paphiopedilum Wallcrest. I'd be chattier, but I was up at about 4:30 AM yesterday, because a storm was rolling through and it was loud. I could have tried to sleep through it regardless, but I was worried about the plants outside -- the forecast had said there might be hail -- so I stayed up worrying about them until the storm had passed, even though there wasn't much I could have done to help them, had hail started to fall. Hoping to get things together for some more substantial posts soon. 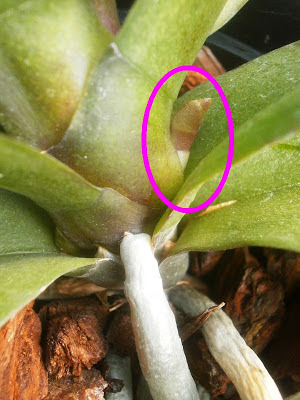 In March 2009, the husband and I went to Cedar Rapids and bought a NOID Phalaenopsis at Frontier Garden Center. I didn't want to, because I was pretty sick of Phalaenopsis by this point, but he paid for it, so okay, fine. Then, five or six hundred years passed. How did this happen? I do not know. It just did. Am I happy about it? I do not know. I think I'm confused? More than anything?